Why does this house have three different colours (and that's just the street facades)? Which one's the right one for a house like this, and for a house like this in 2011? Why is one of them Absurd Azure? I don't have the answers, and I'm not even sure what I think of it, but I do like the fact that it's there. PS. 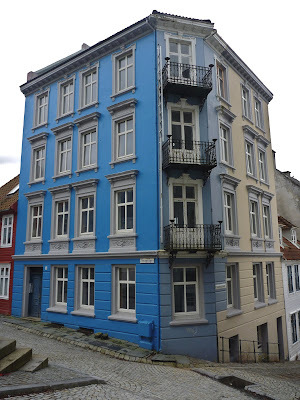 This building type is a relative of the Berlinian apartment house which imported to Norway in the 19th century. They don't have a very nice reputation, but I love them for such reasons as their nice scale, lofty ceilings, flexibility, wedding cake-like ornamentation and ability to house many people while creating positive outdoor spaces around them. None of the colors are historially correct. These houses were not painted originally except for the windows and doors.